Are CashNetUSA's Personal Loans Unsecured? While our online loans are not secured by any physical goods (such as an auto title), CashNetUSA does take a security interest in your ACH authorization if that is your chosen repayment method. But with CashNetUSA, you’ll never have to worry about putting any of your property at risk to obtain approval for your loan. What Does Less-than-Perfect Credit Mean? "Less-than-perfect credit" refers to a credit score lower than what mainstream banks and lenders traditionally consider an “excellent” score. This score might be low because of factors as diverse as missed payments or multiple credit or loan applications — these applications can leave records of "hard inquiries" on your file, potentially lowering your score and giving the impression of financial distress to companies that look at your credit history. Can I Get a Personal Loan From CashNetUSA with Less-Than-Perfect Credit? Instead of looking at your traditional credit score, we use a proprietary system to determine eligibility. This lets us look at your larger financial history instead of basing our decision solely on your credit score. If you meet our lending criteria, you may well be approved for a personal loan. 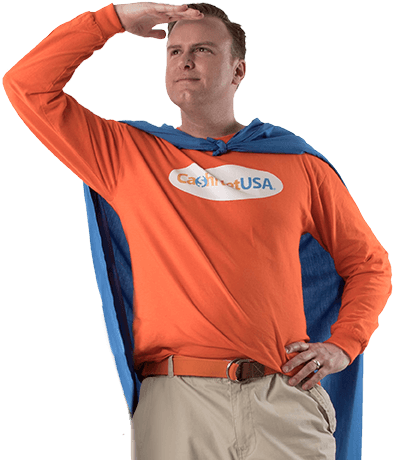 Why Doesn't CashNetUSA Offer "Bad Credit" Personal Loans? Before talking about our loans, it's a good idea to discuss what is meant by "bad credit." As mentioned above, financial difficulties like missing payments or defaulting on debts will lower your credit score. "Bad credit" usually refers to lower credit scores that have been impacted by these financial difficulties; however, it is not a technical or official term used by credit bureaus. Similarly, the phrase "bad credit loan" has no agreed-upon meaning. It’s a phrase commonly used by unscrupulous lenders to entice less-knowledgeable consumers who may have had credit issues in the past. If you see a lender offering loans with great terms to people with "bad credit" or "no credit," you should be wary. It may be a scam and pose serious financial risks. At CashNetUSA, we pride ourselves on being transparent with our customers and always providing clear rates and terms for our products. We offer a variety of personal loan products and have developed our own underwriting process that uses an alternative credit check that looks at applicants' whole financial history, not just a credit score. CashNetUSA is an online lender of quick and easy personal loans with over 10 years of lending experience. We offer payday loans, cash advances, installment loans and lines of credit, depending on which state you live in. You can contact us via phone, email or online chat with any further questions you may have.